Pancake ice, otherwise known as cake ice. Sea ice is classified by stages of development that relate to thickness and age. 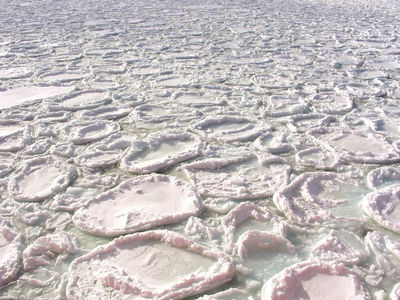 Most scientists describe sea ice only by its age, typically as first-year or multiyear. However, some experts who chart the extent of ice for navigational purposes use specific terms to relate the thickness of ice to its age. New ice is a technical term that refers to ice less than 10 centimeters (3.9 inches) thick. As the ice thickens, it enters the young ice stage, defined as ice that is 10 to 30 centimeters (3.9 to 11.8 inches) thick. Young ice is sometimes split into two subcategories, based on color: grey ice (10 to 15 centimeters, or 3.9 to 5.9 inches thick) and grey-white ice (15 to 30 centimeters, or 5.9 to 11.8 inches thick). First-year ice is thicker than 30 centimeters (11.8 inches), but has not survived a summer melt season. Multiyear ice is ice that has survived a summer melt season and is much thicker than younger ice, typically ranging from 2 to 4 meters (78.7 to 157.5 inches) thick. The following sections describe each stage in more detail.